Editor’s Note: In this PART I of “Beira Baixa: Roads Less Traveled” we delve into the area’s challenges while highlighting its largest private wine producer in the Cova da Beira wine region. In Part II, we’ll explore more about its wines, and pair two with a regional dish. I have this fear that one day the primeval hamlet of Bemposta do Campo, in the Beira Baixa region of Central Portugal where my mother’s family is from, will disappear. Sometimes, I feel as if it was a mirage to begin with or that it’s a top-secret destination that my family guards and sustains simply with love and memories. I may sound mad, but there is somewhat of a basis for my fear. For the last 30 years or so, there has been a significant decline in population in these villages from North to South and in between. There are some with only 70 to 200 residents and most of them elderly folks. This has led to closing of schools and lands left uncared for. There are times I think all of Beira Baixa will fade into nonexistence. There are, of course, endless socio-economic factors and such at play here. And though the scenario has been grim at times as tourists opt instead for coastal experiences, for example, or residents migrate to the big cities or abroad, there is a light at the end of the tunnel. Tourists in the recent past have been seeking more authentic rural lifestyle-based escapades that these interior villages can provide, coupled with centuries of history and gastronomical one-of-a-kinds. Younger generations choked by the high-cost living in urban areas have sprung up in these forgotten lands as well, taking advantage of quality living far from traffic jams, more space and in many cases a manageable two-hour drive to the cultural hubs of Lisbon and Porto. Some have started up businesses, while for the first time in their lives taking a stab at farming on fields, usually inherited from their grandparents. Case and point is my cousin Nelson, who moved his family from Vialonga in the outskirts of Lisbon, to open up a car repair shop in Idanha-a-Nova, one of the more prosperous Beira Baixa villages, and has planted fruit trees and vines in a nearly abandoned piece of land in Bemposta that belonged to our grandparents. His parents have retired in Bemposta, too, building a home where our grandparents’ stables used to stand. My parents are immigrants living in America, but own a vacation home in neighboring Pedrogao de Sao Pedro and twice a year return, taking care of a picturesque piece of land my grandfather grew his vineyard on. My other cousin Paulo Jorge, an executive living in Vialonga, is building a summer home smack in the middle of grounds that I and my nearly 30-something cousins played on as kids while our grandparents planted, watered and picked crops.My uncle, who is retired from the Portuguese Navy, has also built a vacation home and planted vines in Bemposta. His son, Bruno Caldeira, has promoted Bemposta through the “Bemposta on the Road” photo exhibit that has visited London, Helsinki, Tallinn and Compostela de Santiago. It’s a beautiful thing. Is it enough though? I’m not sure. But it’s something. The villages in the enigmatic Beira Baixa are probably at even greater risk than say the interior villages of the sought-after Alentejo in the south where Lisbonites and others have been purchasing traditional country homes called “montes” as the trend picked up in recent years. Beira Baixa, however, may share blame for not always marketing itself enough, which is thankfully gradually changing. The big success story is the push for the coveted cheese from the Serra da Estrela, which has helped the national park and the villages it cradles stand out. 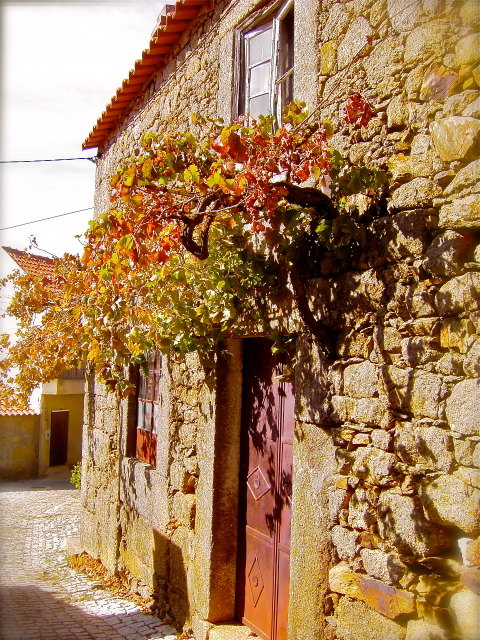 But Serra da Estrela villages fall both under Beira Baixa and Beira Alta. Confusing, I know, which is why calling either one just Beira Interior, as it’s sometimes done, can be messy. They’re distinctly divided as North and South, similar to Upper and Lower Alentejo. But in terms of wine, to distinguish it from the established Dao wine region in Beira Alta, the three wine sub-regions (Castelo Rodrigo, Cova da Beira, and Pinhel) in Beira Baixa are denominated Beira Interior D.O.C. There have been more efforts by locals and national celebrities, like Catarina Furtado, touting her Beira Baixa origins on TV, which helps educate about the region. Her roots are in Penamacor, considered the county Bemposta belongs to. The district is Castelo Branco, the main city in the area. In general the Beira Baixa remains an anomaly to most. Even the accent is unique with a lisp-like “sh” similar to our Spanish cousins, but without switching the “B” for a “V” and vice versa as they do in Beira Alta, which helps pinpoint more quickly where those folks are from. There’s also the Beira Litoral (to make matters more complicated) which completes the three Beiras. But the latter is coastal and home to the heralded Coimbra University, Figueira da Foz beach and the “Venice of Portugal” Aveiro, so it gets plenty of play. The confusion crosses oceans, too. In Portuguese communities in America, it’s a rarity to bump into someone from Castelo Branco among the vast regions represented. Tell them you’re “Albicastrense” and watch the blank stares widen. Hardly any immigrants I have met here realize that those born in Castelo Branco district are Albicastrenses. The stares lessen when you simplify that you’re near Serra da Estrela, whose residents have built a name for themselves in these communities. This identity crisis spills over into the wine industry in the Beira Baixa. In 2009 when the RTP network’s wine show “Hora de Baco” visited Quinta dos Termos in Enguias in the county of Belmonte, which is one of the larger and very delightful Beira Baixa villages with the greatest Jewish community in Portugal and the birthplace of Pedro Alvares Cabral who discovered Brazil. It’s also where my father’s paternal family is originally from. The show interviewed the then oenologist Virgilio Loureiro as well as the proprieter and wine producer Joao Carvalho at Quinta dos Termos, the biggest private producers of the Cova da Beira wine region where there are many more other wines to discover. But Quinta dos Termos Seleccao 2007 red was the only Beira Interior wine named to Tom Cannavan’s 50 Great Wines of Portugal in London this summer. In some ways, the Beira Baixa shares the same challenges Portugal has faced all along when marketing its brands internationally. Often overshadowed by more easily identifiable countries, like Italy, Spain and France, as wine quality has increased and the marketing gained momentum in the last few years, it’s finally getting some attention. The hope is that Beira Baixa’s story will unfold similarly. But it may face an even greater hurdle that Loureiro poignantly underlined. He lamented that the Beira Baixa is practically undiscovered by the Portuguese let alone the world. A shame, Loureiro argued explaining that the Beira Baixa’s hilly landscape is special and unlike any other in the country. Its lands are wrapped by the Serra da Estrela and Gardunha mountains and peppered with wild pine forests and a soil rich in granite. It’s also where rivers like the Zezere begin before flowing into the Tagus River in Lisbon. And, it has a continental climate with scorching summers and very cold winters, a winning recipe for some of the most notable wine-producing regions in the world. One great example is France’s Burgundy wine region. And as we come full circle, I tap my original point that it’s the returning native sons and daughters that are breathing new life into the villages of the Beira Baixa, which also applies to local wine success stories like Quinta dos Termos. This venture has thrived because Carvalho invested the fruits of his day job labors in a vineyard that at its core is the house he was born in. 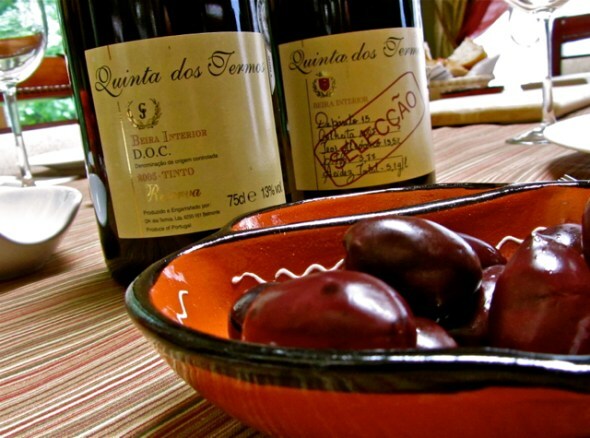 In Part II of our travels through the Beira Baixa, we’ll taste two Quinta dos Termos’ reds my father was kind enough to bring back from one of his trips to Portugal. We’ll pair them with a regional dish that I prepared with my mother. We spent long hours in the kitchen, which transported me to the bygone days when my late grandmother’s daughters—my mother and her five sisters came together to prepare rustic meals for the whole family, while we kids peeked inside in between the commotion we caused playing along the narrow, cobblestoned streets that in despite of my fears haven’t disappeared.